A life in a webbis: Congratulations to all NEW MOTHERS out there! Congratulations to all NEW MOTHERS out there! Assalamualaikum wbt friends! Today i feel like i want to share my thoughts and experience from being a new mother to just a mother. Yes. There's definitely some huge differences between these two phrases at least to me. When Marissa was born, i was still thinking that my life is not going to change one bit. Well, it changed 360 degree! Haha. To top it off, i am the only child in my family and i never held any newborn baby before, i did not know what to expect and i have ZERO experience in handling a baby. I just don't. So, when Marissa first trip to home from the hospital and her first night at home was a disaster. With me trying to cope on how to hold my own child to clueless on her feeding time and so on, i kind of had a little bit of a meltdown that night. Since we are living in my parent's house, my mom freaked out a bit as well as she did not held any baby for like, 32 years now? Haha. So everybody was clueless and panicked. Well, there are few reasons why new born baby cries. First, she's hungry. Secondly, she's wet her diapers and thirdly probably she's colicky but there's more to that in the list. You just have to know what your baby want and it is super hard for a first timer like me! When she reaches one month old, everything seems to be well now. I know her sleeping time, i know her feeding time and so fourth. So these 1 month really made my life easy as i can always look at the time and i know she's hungry. Haha. 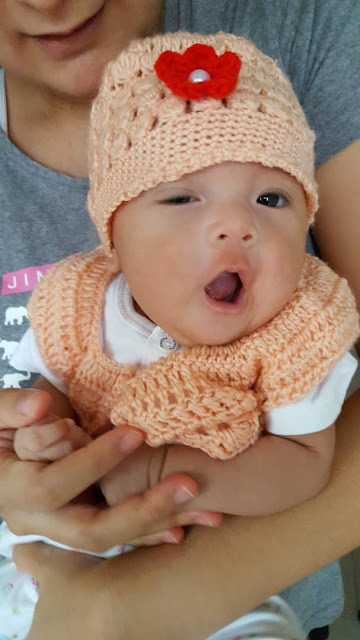 During her second month, i think it was because of a growth spurt, she just would not want to sleep in the morning and i started to feel a bit depress and started to compare my baby with others which is a SUPER NO NO TO DO!Yes mothers! Do not compare your little baby with others. And i did it with other babies which is far more older than her, like she's 2 months old and i'm comparing it with a 4-5 months old baby. I regretted doing that now cause not all babies are the same. I have my unique Marissa and others have their super lovely baby as well and all of them are different. So new mothers out there, please do not compare your baby with others. I have learnt my lesson now. Well, my baby turns out to be super perfect now. She sleeps whenever she wants to and sometimes just by herself (this one especially when we are outside, in a mall perhaps). Well, apart from please do not compare your baby with others, i would suggest you to just follow your instinct whenever it comes to everything about your baby. I do have few items in which i use onto my baby like all those minyak and stuffs. If you want to know what did i use, i'll blog about it soon. Well, this entry is to actually congratulate all NEW MOTHERS out there who currently trying to adjust their new life. Mind you, i did have a little post pregnancy depression before (yes i do) but i fight it myself cause i do not want to have that negativity in me. I used to think that my husband would not be loving me anymore as now we have Marissa in our live. We just can't eat together anymore, can't pray together anymore and all those together thing. I even feel a bit left out as i have to sit at the back with my baby as i am not used to do that. But, i always tell myself this 'Well, Marissa is not going to be this small FOREVER. So cherish it while you still can'. Yes. 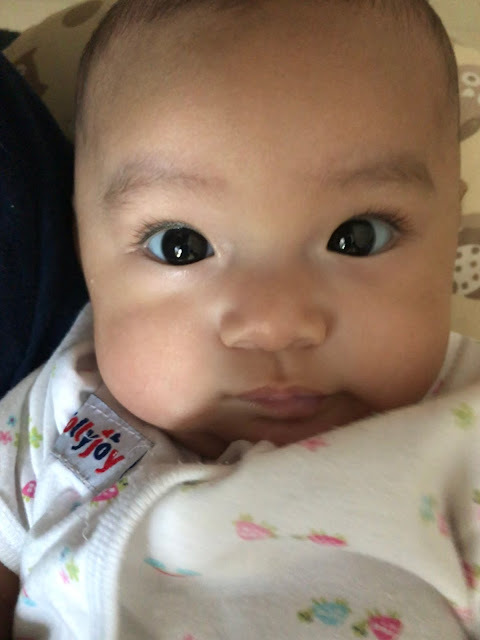 She's not going to be 1 month, 2 months, 3 months baby anymore. She's growing and everyday is a new day for her. I would not want to waste my time thinking about some nonsense where i could just spend my little time playing and goofing around with her. Now, my life evolves around her. No more Sephora for me. Now it is Mothercare time, H&M Kids, CottonOn Kids. Haha.